1. Enjoy a magical walk- We have over 1,200 miles of public rights of Way in the National Park – perfect for cosy walks all wrapped up in your winter woollies – find out more here. 2. It’s Christmas market time! Get into the festive spirit by visiting one of the many Brecon Beacons‘ Christmas markets and fairs. We have lots of Christmas markets and fairs happening in communities right across the Brecon Beacons, it’s a perfect way to get in the mood for Christmas and start your shopping- let the festivities begin. Check out our guide here. 3. Plenty of Cafes for a hot chocolate and a piece of cake – A blustery walk is nothing without a hot chocolate stop mid way and or at the end. Here’s our top café guide– where will be yours? 4. Cosy pubs – Need we say more? It’s cold; you want a cosy pub with a roaring fire and bustling atmosphere. What better than a pie and a pint after a bracing winter walk in the Brecon Beacons? 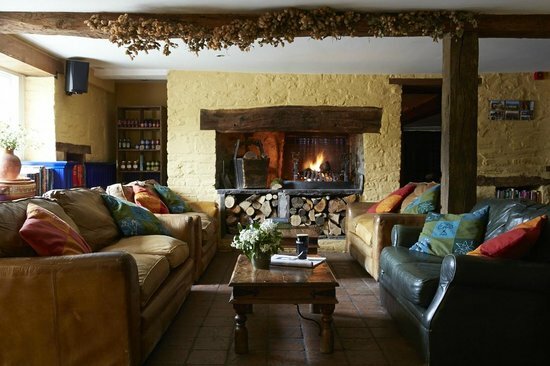 Check out some of our best pubs and inns here. 5. Picture-postcard perfect Yes, we know the National Park is stunning all year round but the countryside takes on a new beauty on a frosty morning or on a snowy day. Simply takes our breath away. Check out some great shots on our Instagram here. 6. Dark nights, bright stars The Brecon Beacons National Park is an International Dark Sky Reserve and offers visitors the chance to see the Milky Way, major constellations, bright nebulas and even meteor showers on clear nights. With some of the highest quality dark skies in the UK, the Park makes for an idyllic retreat for stargazers. You’ll find some of the best stargazing spots in Europe. Regular stargazing events help more and more people enjoy the spectacular night skies. More here. 7. Plenty to do with your kids – There’s plenty of places to catch Santa in his grotto and lots of Chrsitmas displays on show! You can visit the Old Railway Garden Centre for loads of gift ideas, visit Santa at Cantref and take parts in lots of events at Blaenavon World Heritage Site! Scroll through our blog to find some of the Christmas adventures you can have here! 8. Have an adventure – The Brecon Beacons National Park offers an array of activities – and the winter is no exception – find out more here.